Throughout the nation, homeowners have felt the sting of declining home values for some time now. A stagnant economy and lack of available jobs have only compounded the issue. Where are home values at in DuPage County? We don’t need the chart above to know that the value of our homes have declined substantially over the part few years. 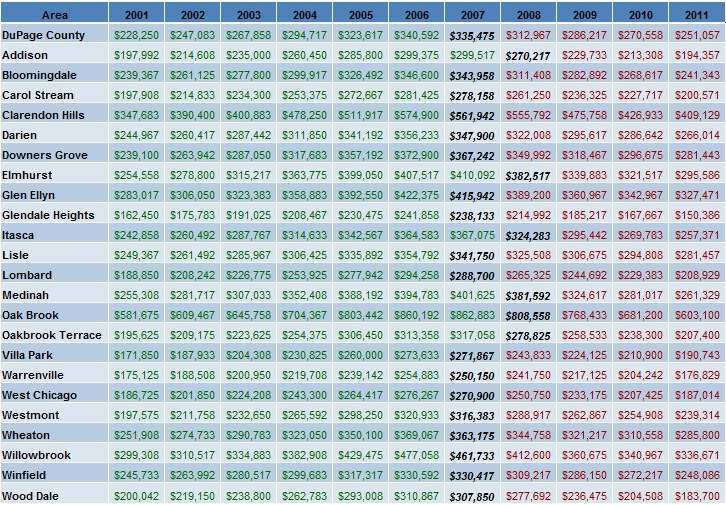 What this chart does show us is that our homes have lost nearly all of the gains in value made over the past ten years. We can see from the chart that the rapid decline in home value started in 2007 or 2008. The decline has continued since then. Today, a single-family home in DuPage County is worth a little more or a little less than it was worth in 2001. 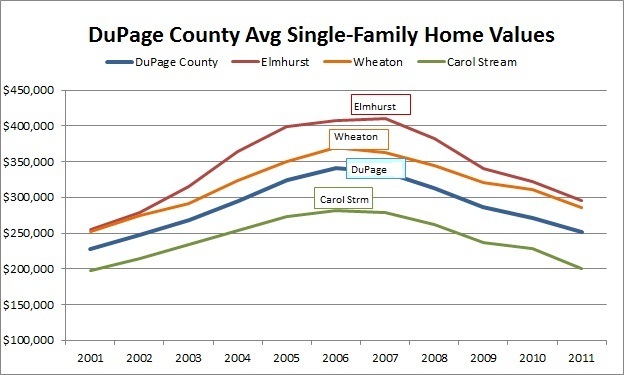 The average single family home in DuPage County has lost roughly 25% of its value between 2007 and 2011. At a 40% drop in value, Wood Dale suffered the biggest losses. 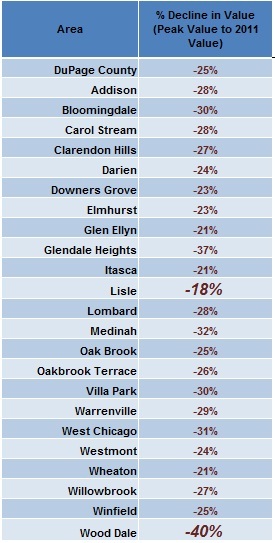 Lisle seemed to hold the greatest amount of home value over the period, losing just over 18%. It’s still early to get a finalize 2011’s averages, but there has been some minor month-over-month improvement in DuPage County home values lately. However, with the economic conditions in a state of seemingly perpetual duldroms, it would be surprising to see any major increase in market value anytime in the near future. ** NOTE ** The data used in this post was acquired from zillow.com in September 2011.